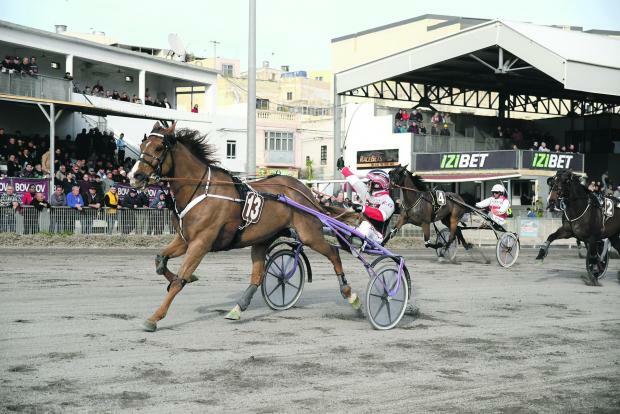 The fourth meeting of the year, consisting of eight races all for trotters, was held at the Marsa Racetrack yesterday afternoon. Four of these races were heats from the Assikura Championship for class Bronze trotters on a short distance of 2,140m. Yesterday’s card also included a class Premier race on a long distance of 2,640m which was won by Truscott Du Guepre. Thirteen horses lined up for the class Premier race. It was French newcomer Tsunami (Carmelo Farrugia) which was the fastest horse early on, opening a small lead from Unrefundable (Anton Cassar) and M.T. Gogogirl (Nathaniel Barbara). However, with a lap to go, Truscott Du Guepre, under the guidance of Rodney Gatt, started to up its pace from the outside and took the lead around 500m from the finishing line. Truscott Du Guepre cruised past the finishing post first by a length from two other newcomers from France, Twist Des Pleignes (Noel Baldacchino) and Touch Green (Charles Camilleri). Unrefundable finished in fourth place. From the four class Bronze heats, 16 horses qualified for the semi-final stage. In the first heat, French Reveal Champ Blanc (Tony Cauchi) was unchallenged during the 2,140m distance. Cauchi’s trotter sealed its first win of the year from Sound Of Silence (Charles Camilleri) and Upaveda (Ivan Stivala). Caiprinha Royal (Marco Debono) was also through. Swedish newcomer Fart Kloster (Darren Grima) led all the way in the second class Bronze heat. Fart Kolster gained its first win in Malta by a length from Altesse Atout (Andrew Farrugia). Rayon De Soleil (Paul Galea) and Zootaren (Kevin Sciberras) completed the top four order. In the third heat, the early leader, French veteran Petrus Du Vivier (Chris Cassar), ran out of steam midway through the final straight. This trotter was overtaken by Ultra Nico (Eric Bezzina) which cruised to its second win in Malta from Reader JYL (Michael Ellul) and Oregon Frontline (Rodney Gatt). Petrus Du Vivier had to settle for fourth place. French Borsalino Maza (Ivan Stivala) had to go all out in the final stages of the fourth and last class Bronze heat. This French trotter registered its second win in a row from Magic Melon (Ryan Abela) and Italian newcomer Tiger Breed (David Ellul). Ticket Gagnant (Silvio Schembri) followed home. Another meeting at the Marsa Racetrack will be held on Sunday, starting at 1.30pm.